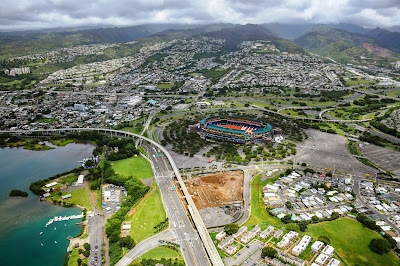 Aerial view of the guideway near the Halawa station. Rep. Sylvia Luke: Move Rail Inland To Avoid Sea-Level Rise. Mayor Kirk Caldwell called the idea a “red herring” that would kill the project. Civil Beat. Luke tells HART board to move rail project mauka. Citing a recent report on rising sea levels, state House Finance Chairwoman Sylvia Luke pressed city transit officials Thursday to consider shifting the route of its planned rail line from Middle Street to King Street and the University of Hawaii instead of through Kakaako to Ala Moana Center. Star-Advertiser. Top lawmaker says rail should avoid Kakaako. The reason? Climate change. Hawaii News Now. Honolulu mayor urges HART board to consider alternative ways to pay for rail. KHON2. Congressional candidates share views in forum in Waikiki. Who will voters send to Washington D.C. to fill congresswoman Colleen Hanabusa's seat? KHON2. This Democratic Party Email Promoting Hanabusa Is Raising Eyebrows. The party says it really didn’t mean to promote the gubernatorial candidate over her Democratic rivals, including Gov. David Ige. Civil Beat. Gubernatorial candidate Colleen Hanabusa touts leadership skills in run for top office. KITV. Schatz Introduces Bill To Shore Up Local Emergency Alert Systems. The bill would require alerts to run repeatedly on TV and radio, and potentially also run on streaming services such as Netflix. Civil Beat. Emergency alerts could soon interrupt streaming services like Netflix, Spotify. Bill would require online streaming services to carry broadcast emergency alerts. KHON2. Hawaii Gas issues RFP for purchase of renewable natural gas. Hawaii Gas is taking the next step in its clean fuels diversification strategy by issuing a request for proposals to purchase renewable natural gas. Pacific Business News. Teachers spend hundreds on supplies for their classrooms they are never reimbursed for. KHON2. 2018 monk seal pup season is record-breaking — but hold the applause. Hawaii News Now. Caldwell considers mental health facility as chronic homeless return to park. Star-Advertiser. City Council committee advances "monster homes" bill. Demolishing monster homes after they're built, and fining contractors who keep building when they're told not to. Those are at the heart of two bills circulating at the Honolulu City Council. KITV. Police seek help with cold cases. The Honolulu Police Department is putting a spotlight on dozens of cold cases under a new cold-case program called A'ole Poina, which means “never forgotten.” Star-Advertiser. Campaign aims to keep roads safe with eye contact, spirit of mahalo. KHON2. Chamber of Commerce Hawaii is declared the best. Star-Advertiser. West Oahu home sales post double-digit gain, East Oahu prices rise. Communities in West Oahu saw double-digit gains in single-family home sales last month on modest price gains, compared to the same month last year, while several East Oahu communities scored double-digit gains in prices in June, according to the local market report from the Honolulu Board of Realtors. Pacific Business News. 2 arrested as manhunt continues for man accused of killing officer. Hawaii News Now. As of 11 p.m. Thursday, authorities confirmed a male and female were taken into custody in South Kona during search efforts for a suspect accused of shooting and killing a Puna patrol officer earlier this week. West Hawaii Today. Law expert questions why accused police officer killer was free in the first place. In 2013, Waiki was found with drugs and a loaded firearm in his car, court records note. He was sentenced to 18 months in jail with 4 years probation. In 2016, he violated probation. Police issued a warrant for his arrest. KHON2. Incumbent County Council members held tight to the money lead in the most recent campaign finance reports, with most accepting large contributions from unions and other special interest groups, compared to smaller donations from individuals. West Hawaii Today. Last Time Hawaii Had Lava Refugees, It Built A Ghost Town. After Kalapana was devastated in the 1980s, the state laid out a new subdivision complete with utilities. But only now are a few people moving in. Civil Beat. Number of evacuees staying in shelters down. Tribune-Herald. A six-month moratorium on sand mining on Maui expires today. Lance Collin is an attorney who represents the community group Malama Kakanilua, which seeks to stop sand mining and development on Hawaiian burial grounds. Hawaii Public Radio. Portions of the seven-story hotel that was once the Maui Prince and Makena Beach & Golf Resort are coming down. Maui News. Jury awards Maui couple $1.7M in suit against their condo association. A jury has awarded a Maui couple more than $1.7 million in a disability discrimination lawsuit against a Kihei condominium association. Hawaii News Now. Haena repairs to begin soon. The state Department of Land and Natural Resources has let contracts totaling more than $2.9 million for repairs and new construction at Haena State Park that will set in motion a long-term plan to substantially redo facilities in the Ke‘e Beach area. Garden Island. The Hawaii Island police officer shot and killed during a traffic stop Tuesday was a 1990 Waimea High School graduate with family on Kauai. Garden Island. Absentee mail ballots offered to North Shore flood victims. The Office of the County Clerk, Elections Division is reminding voters who reside in the Wainiha-Haena area that Elections Division staff will be at the Hanalei Colony Resort today between 9 a.m. and 3 p.m. to distribute absentee ballots to area residents who submitted applications by July 6. Garden Island.